Happy Birthday to Brian Ward! We just wanted to be sure to post a birthday wish to you on your 2nd birthday! Here you are with your cousin Owen last September (luckily the bath toys were conveniently placed)! We hope your big day was FULL of fun. Happy Birthday Anna! We can't believe you turn FIVE today. We hope you have some fun plans for your big day. 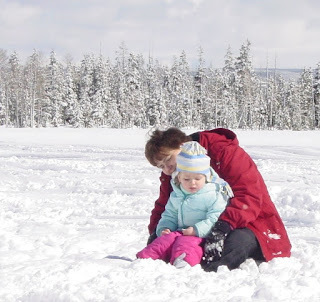 We thought we would put this picture of you and Grandma Anna on our blog so every one can see how beautiful you are (even in all your snow gear)...and to get everyone excited for the Annual Family Snowmobile Trip next month. We love you! Happy Birthday! 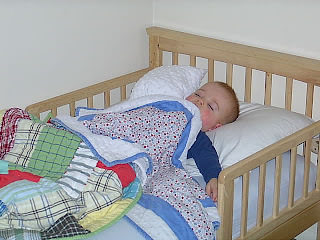 Yesterday was Owen's first night in his big boy bed! 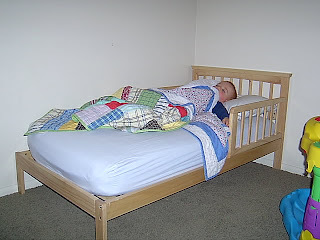 We knew we needed to get him into this bed before the new baby arrived, but we weren't planning on this soon. 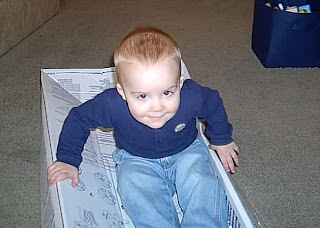 Kevin and I just couldn't wait to see Owen in his new bed so we tried it last night. We were so proud when we laid him down and he actually stayed in his bed. He slept all night long and even waited in his bed for us to come get him once he woke up. So tender! What a good boy! He also got a big boy haircut this weekend, so I had to include a picture of how handsome he is. 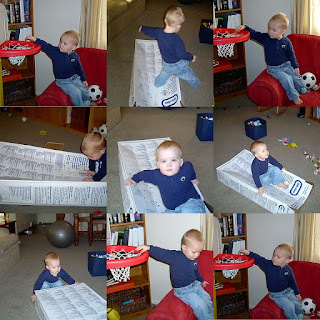 Then, over the weekend Kevin insisted that "Owen" needed a basketball hoop in the house. So, after much begging, we went and bought Owen his first basketball hoop! Owen loves the new hoop (especially when Kevin pushes it close to the couch so he can dunk the balls) but he really had to fight for a chance to shot the ball. 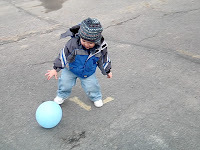 I must admit it is quite entertaining to see my two boys fight over the ball. Owen loves playing with his new hoop AND the box it came in. Well, Valentine's Day has come and gone. We had a great day. 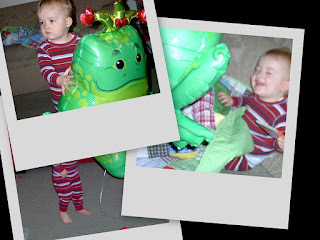 We gave Owen a huge frog balloon and a cute Valentine book that plays a catchy tune. He LOVES the book and usually takes it with him to bed. But, it took him awhile to warm up to the frog. 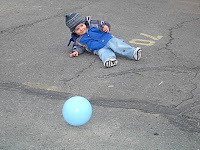 He was a little afraid of the balloon for most of the day. But, it was very entertaining to see him punch the frog around the room whenever it got in his way. Kevin made a great breakfast (French Toast) and then gave me a spectacular Valentine. 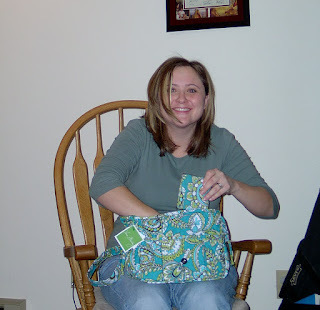 He surprised me with a new Vera Bradley purse and wallet. I love it! Too bad I only gave him a can of Almond Roca! Oh well. Here are some fun pictures from our day. Owen and his frog balloon. 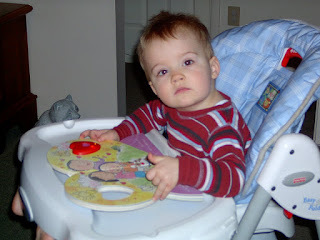 Owen waiting patiently for his breakfast, and enjoying his new book. I love how he keeps his finger on the heart button, so as soon as the song ends he can start it again. My new Vera bag and wallet. LOVE IT! 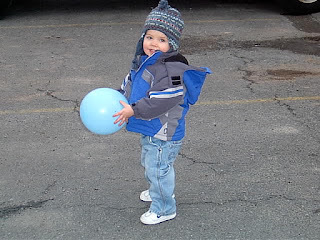 Owen LOVES balloons! And lately he likes to play with them outside. This usually results in me getting a lot of exercise chasing the balloon around because of the wind. But, today Owen was able to keep up with the breeze on his own. 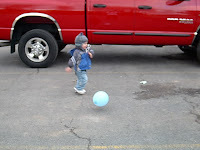 He just tosses the balloon and chases it around the parking lot. Fun, right!? He loves it! 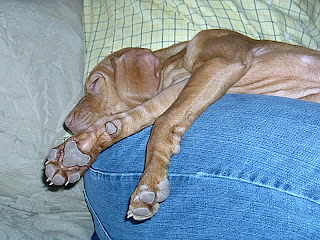 And I love it because it wears him out! Saturday afternoon we had a surprise visit from my brother, Ben, and his wife. They had just purchased a new puppy in Pocatello and brought her by for a visit. She is so beautiful... 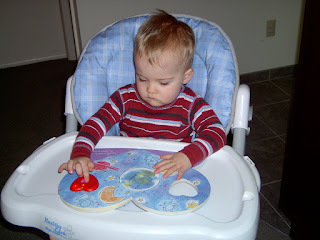 I had to post the pictures on my blog. They named her Meisha (not sure if this is correct spelling). 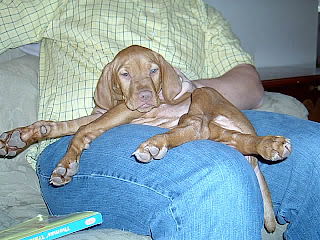 She is a Vizsla, an Hungarian Pointing dog. I have never heard of this breed, but she was so danty as she walked around. Quite a princess! We were so glad they stopped by.